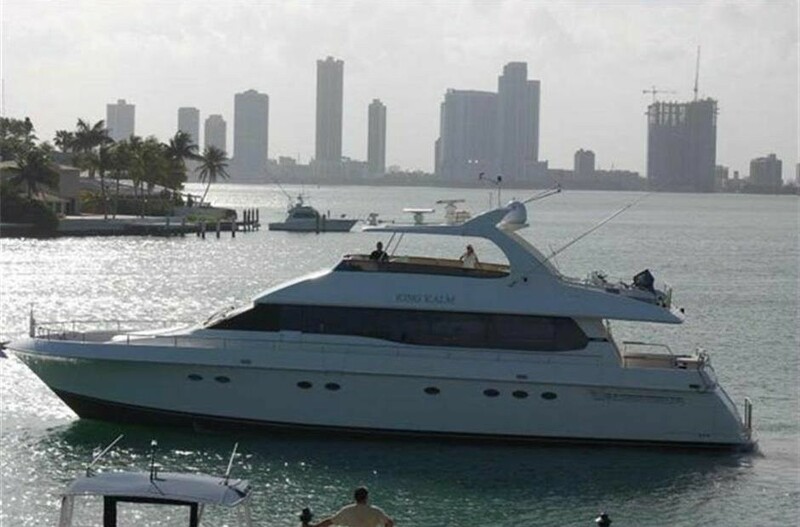 Luxury motor yacht KING KALM is an 80ft Lazzara available for private charter from the sun drenched islands and sandy beaches of the Bahamas to the lush and verdant BVI and Caribbean year round. 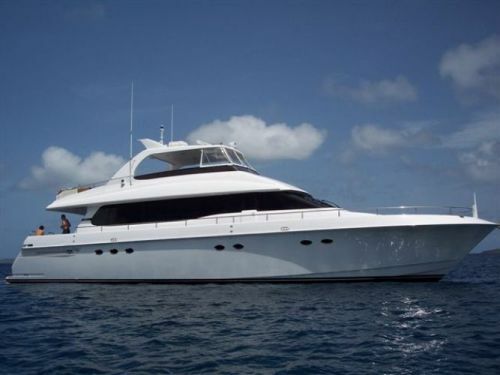 Indulge yourself in her elegant accommodations, gourmet delights and exceptional service while exploring exotic destinations and crystal blue waters you have only dreamed of. 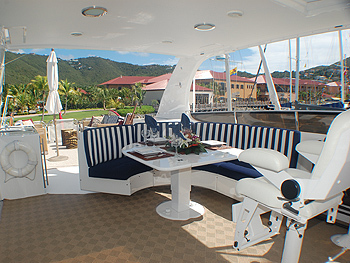 KING KALM invites guests into her spacious and stylishly decorated interior, fully air conditioned for your cruising comfort. 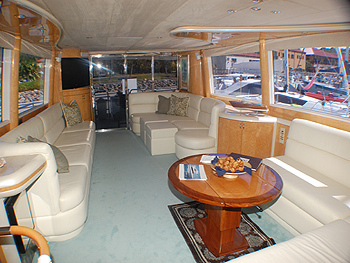 Her main salon provides a number of unique areas for lounging, watching a movie or gathering for cocktails and hors d’oeuvres while relaxing on her sleek leather sofas. 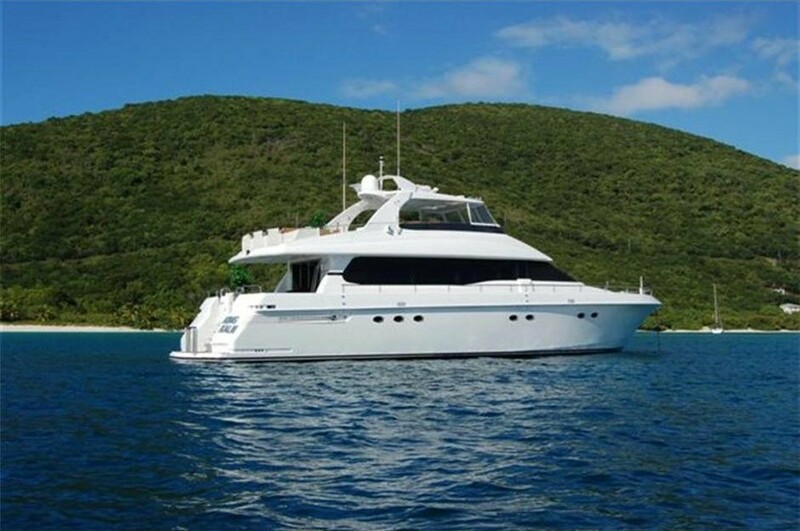 Her large all-around windows allow you to take in the scenery while cooling off from a day of fun in the sun enjoying the islands of the Bahamas and Caribbean. 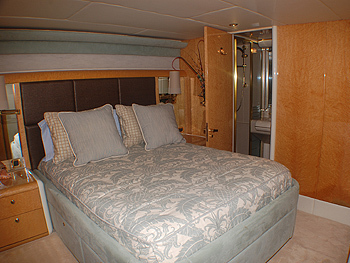 Her four large and elegantly appointed staterooms all feature private bathrooms with showers, Satellite TV, DVD and CD entertainment system, and individual climate controls. 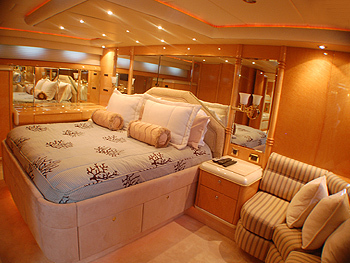 The King-size Master Suite also features a seating area, as well as Spa Pool tub and his and her vanity sinks. 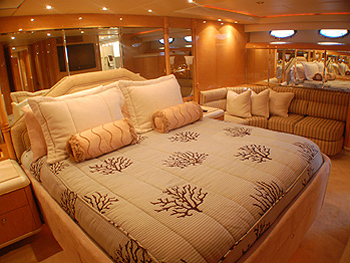 All are beautifully furnished in natural tones with light wood finishes, custom upholstery and linens, and offer all of the quality and amenities you would expect to find on a fine motor yacht. 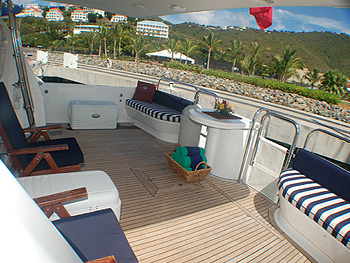 Above decks KING KALM offers a variety of spaces to relax and enjoy the beautiful views and tranquil breezes of the Caribbean. 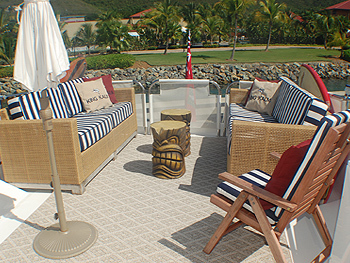 Dine alfresco, do a puzzle or simply chill out in the shaded cockpit, or soak up the sun in the nautically upholstered deck lounge, featuring exotic touches such as tiki tables and teak and rattan sofas and lounge chairs for your comfort and relaxation. 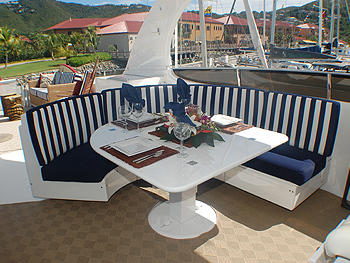 Her flybridge sky lounge offers a quiet place to escape, or yet another option for outdoor dining and cocktails. 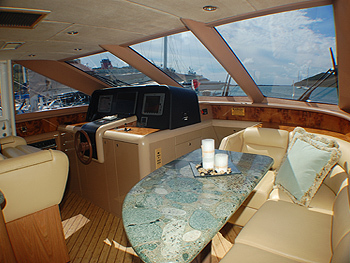 Guests on KING KALM will be warmly welcomed by her professional Captain and Chef/Hostess, who will care for your every need during your time onboard this stunning yacht. 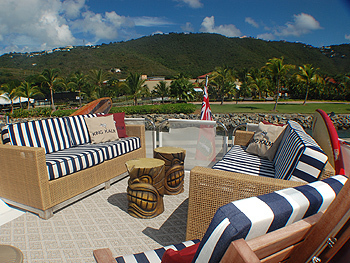 Enjoy creative and healthy gourmet meals and nibbles featuring local ingredients freshly prepared to your taste. 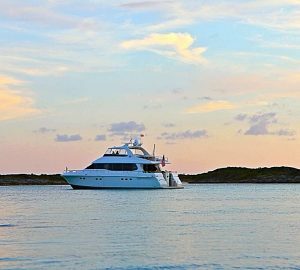 With their years of experience cruising the waters of the Bahamas and Caribbean, you are sure to experience the best that a private yacht charter has to offer. 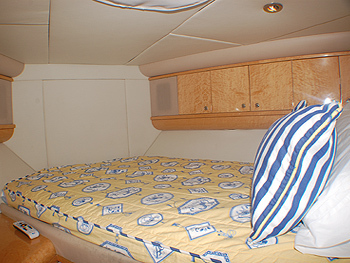 Up to 8 guests are comfortably accommodated in four spacious and tastefully appointed staterooms ( 1 Master King, 2 VIP Queens, and one twin upper/lower), all with private ensuite bathrooms with shower, entertainment system and individual climate control. 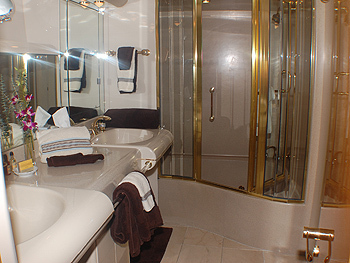 The King Master Suite features a seating area and spacious bathroom with shower, Spa Pool tub and his and her wash basins. 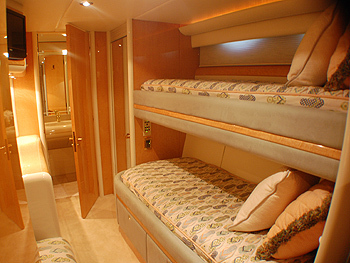 KING KALM offers all of the amenities of home and is fully air conditioned, with Satellite TV/DVD/CD entertainment systems and individual climate controls throughout . 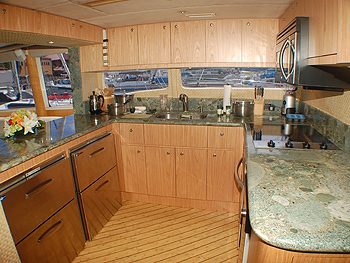 Extensive DVD, CD and reading libraries, as well as an outdoor BBQ and freshwater deck shower add to her onboard comforts. 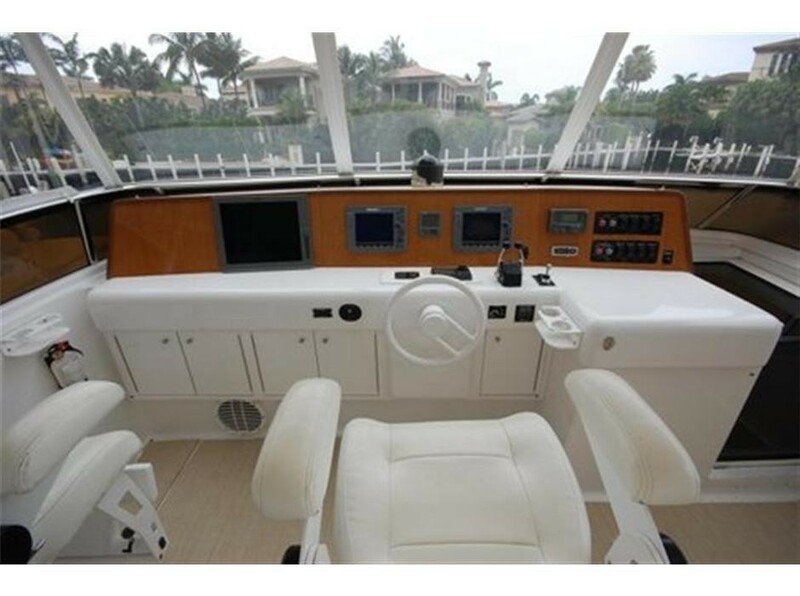 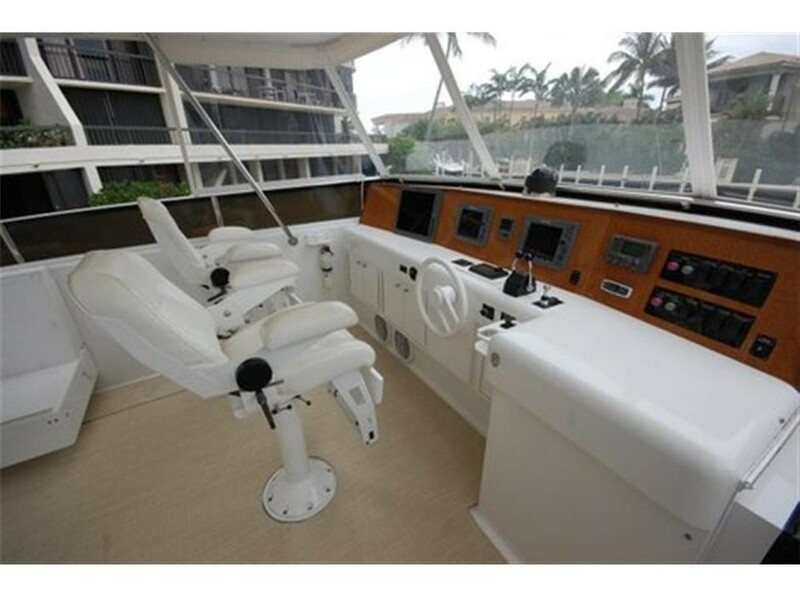 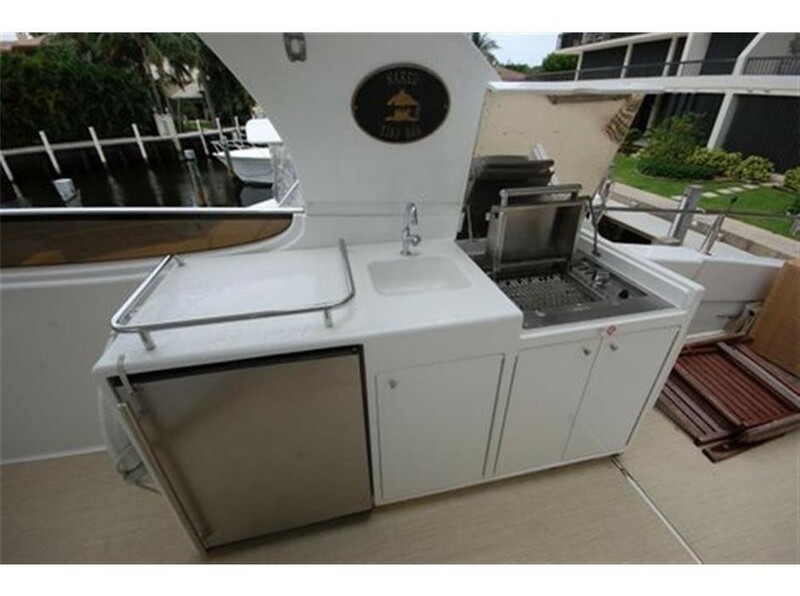 KING KALM carries an array of water toys including 8-passenger dinghy with a powerful 70hp motor, water skis, waverunner, towing tube, glass-bottoms 2 person kayak and full complement of snorkeling and fishing equipment. 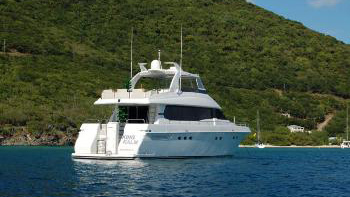 Rendezvous diving is available on request.